Northview’s Food Service is committed, through teamwork, to provide nutritious, well-balanced meals in a respectful, friendly manner. Visit these websites for information on continuing to receive nutritious meals during the school summer vacation. Click HERE to find a Summer Food Service Program site. Click HERE to view a list of participating sponsors. The current scheduled meals for February is accurate on the calendar. The FALL menu will be made available online before school starts and sent home on the first day of school. Breakfast is offered at all Northview schools before school begins in the morning. Breakfast consists of fruit, grain, meat/meat alternative and milk. Lunch consists of a fruit, vegetable, grain, protein and milk. 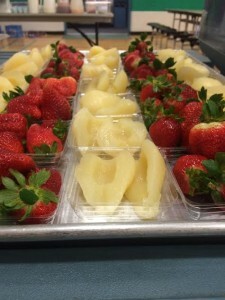 Students MUST take a fruit or vegetable at lunch and breakfast in order to qualify for meal “pricing.” If your child is a participant in the free and reduced program and they are being charged for their meal, it may be because they are not taking all of the components. Please encourage your child to take advantage of getting at least one item from the fruit and vegetable bar. If there is not something offered that day that they want for their meal, please have them take an item that can be put into their backpack and taken home for after school. NOTE: When school is unexpectedly cancelled, please be aware that the menu choice from the day when school is closed will be served on the next day school is in session. One beverage (milk or juice) is included in the meal price above. If a child wants a second beverage or a beverage to go with a sack lunch, the price is $0.50. A beverage is not free unless a meal is purchased. Please see our Frequently Asked Questions (PDF) to see if your child is eligible to received free or reduced meal pricing. Fill out a Free and Reduced Price School Meals Family Application online by using www.lunchapp.com. The site walks you through a set of questions and sends the information directly to Northview. What are the advantages? You will not have to send in the paper application. Your application is processed in most cases in less than one business day. Be sure to list ALL household members on the same application with ALL household income. If you are currently receiving food stamps you MUST include the case number. Benefits are based on household size/income ratio. If you do not have access to a computer, contact Jan Jager or pick up a paper application from any of our school buildings. IF YOU HAVE RECEIVED A NOTICE OF DIRECT CERTIFICATION for the current year for free meals, DO NOT complete the Application; but, do let the school know if any children in your household are not listed on the NOTICE OF DIRECT CERTIFICATION letter you received. As noted on the Application, school officials may require applicants to verify information provided on this application. This site was created by and is maintained by lunchapp.com. Northview Public Schools does not endorse, insure the accuracy of, or vouch for the safety and privacy of any linked sites nor does it assume any responsibility for the content found on these sites. Contact Jan at 361-3473 with questions. (1) You will need your student’s Id. (2) Requests are processed on a daily basis so if you do not receive an Email within one school working day of your request, check your Spam folder as some Email servers automatically “Spam” them. (3) There is NO charge to set up the account and view the history and balances of your children(s) account, however, if you choose to make a payment online there is a small fee to do so. (4) Add children to any current account by giving Jan the new names. WHAT IF MY STUDENT WAS ELIGIBLE LAST SCHOOL YEAR? Students who qualified for free or reduced meals at the end of the 2016-17 school year will automatically start this school year with the same benefits through October 10, 2017 OR until a new form is completed. If you think you will no longer qualify for the program and would like your benefits to run out, please contact the Food Service Director. A NEW APPLICATION MUST BE COMPLETED AS SOON AS POSSIBLE to insure a smooth transition and to insure you do not lose benefit status after October 10, 2017. Benefits are not retroactive and you will be responsible for any charges to your child’s account after October 10, 2017. ATTENTION: Free & Reduced Price School Meals Family Applications are available online! Just visit www.lunchapp.com for quick and easy submission. If applying on-line, do not submit a paper application. 1. SendMoneyToSchool gives you free access to your child’s account to view balances and charges made. Parents & guardians can be proactive and set up to receive an email alert when funds drop below a selected amount. 2. Northview will email parents & guardians daily when an account goes into the negative. Please keep your email address up-to-date in the school office and add jjager@nvps.net to your contacts to assure you receive emails. 1. Make a payment on your SendMoneyToSchool account. There is a small fee to deposit through this website. Funds will show on the account within one day. Northview Food Service, 4451 Hunsberger NE, Grand Rapids, MI 49525 and include your student’s account number in the memo section. 3. Send checks (made out to Northview Food Service) to school with your student. Cash is always accepted, however, cash deposits cannot be guaranteed. All students are assigned a meal account when they enroll in Northview. This account stays the same for the duration of their school years. Students may access their account by registering for the finger scan system. The finger scan system is the easiest and most secure way for students to access their account. The system is a finger imaging program that measure unique points of each student fingerprint and transfers it to numerical number. To register students in this system, the student holds their finger on the scanner while the points are measured and transferred to a unique number. That unique number is now what identifies each student in the lunch room. Fingerprints are not being taken and fingerprints cannot be made from the unique number. Running late in the morning? Kids don’t want to eat after just getting up? Kids ate breakfast but need a healthy snack for after school? Northview Food Service has you covered! All schools offer a hot or a grab -n-go breakfast every morning. Studies show a link between nutrition and learning. A nutritious breakfast helps students be more alert so they can actively participate in class. If you are receiving free or reduced meals join the cool kids club each morning and join us for breakfast!